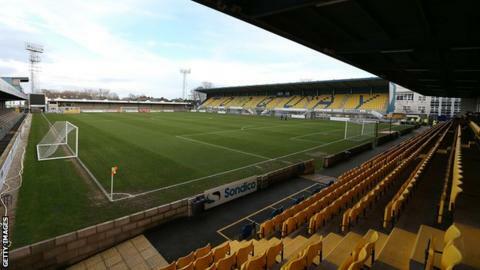 A takeover of National League club Torquay United is close to completion, according to chairman David Phillips. Swindon-based Gaming International Ltd, who run greyhound racing tracks in England and Japan and the National Bowl in Milton Keynes, are currently in the process of buying the club. The Gulls were taken over last summer by a group of supporters after millionaire owner Thea Bristow left. "We're getting very close to the takeover now," Phillips said. "They want to get a football club on board," Phillips told BBC South West. "I've met them and they're very, very good people. I think we need the investment, we've never hidden that - we've never had enough money to really push forward." The club were forced to drastically cut the playing budget, got rid of former manager Chris Hargreaves,closed the youth academy and had to leave their training ground. On the field, the team were 12 points adrift from safety at the bottom of the National League in February, but a run of nine wins in their last 15 league games saw them secure survival on Saturday. "I was one of the fans that saved the club back in June, but now we need to go forward and we need to get back into the Football League," added Phillips. "If we get back into the Football League it'd make a big difference to our club." Phillips is unsure whether he or his fellow directors will remain at the club should the takeover be completed. "We're not sure how the structure will be, but its conceivable that we'll still be here," he said. "I don't know that for certain yet, but that's a possibility."